Healthy snacking in the workplace is something that does more than just feed your employees. Having a regular healthy snack delivery service can lead to many more benefits for both employees and employers. These monthly snack boxes may bring smiles to your staff’s face and could invigorate them, especially on those long days where deadlines are looming or meetings go for hours. Snacking is simply part of everyday life, and if you can offer healthier alternatives, there will be value for all. When considering trying a healthy snack subscription service, you may be thinking about the obvious benefits like improving health. But snacking is much more than just the act of eating. It can influence many other parts of our lives, both inside and outside the office. 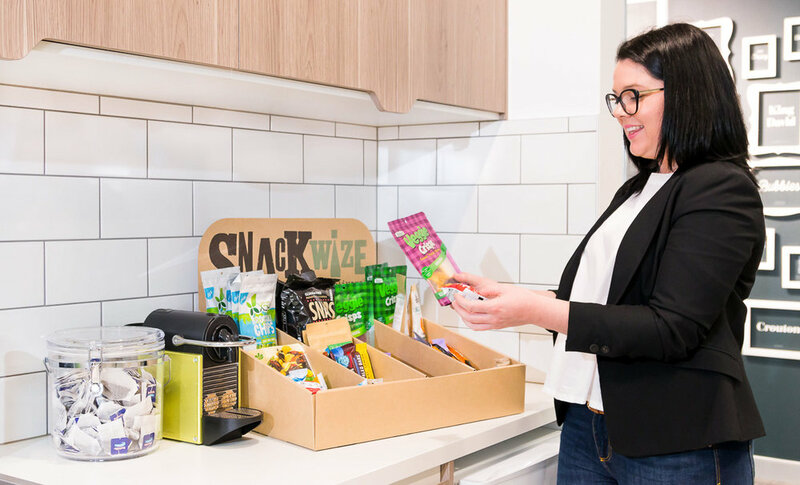 Based on our experiences, feedback from clients, and research, we gathered together 9 compelling benefits of healthy snack delivery to share with you. You may be surprised and intrigued by how the world of snacking can be connected to so many different things, including mood, productivity, inclusivity, and trust. Possibly most unexpectedly, you will also learn how snack boxes could save your company money. You want your staff to be healthy. Unhealthy workers cost employers more each year than their healthy counterparts. On average, sick leave costs workplaces per employee $7,200 a year. Estimates from the Healthier Workplace WA note that absenteeism for healthy employees can be 30 per cent less, which means less sick leave expense. A Medibank study also revealed that presenteeism (employees showing up at work sick) costs the Australian economy around $34 billion a year. Within the ecosystem of health, there are several aspects, each of which contributes to the bigger picture. Being healthy doesn’t just mean you can run for an hour or do 100 push-ups. Health includes every part of how your body works, including energy, cognition, and psychological well-being. Processed foods filled with sugar and carbs don’t offer energy. They might seem to give you a rush at first, but it ends in a crash. Healthy snacks work to avoid the crash. These snacks give bodies the nutrients they need to stay energised for hours. Caffeine isn’t the answer for energy either. Instead, look for snacks with vitamin C, whole grains, and nuts. Chocolate isn’t completely out of the picture, but opt for dark chocolate. Obviously, you want employees to have optimal cognitive function at work. Certain foods, especially those with trans-fat, can deteriorate sharpness and concentration. While foods with antioxidants, protein, and vitamin B can sharpen the mind. Offering employees access to healthy snack options can help them be ready for any challenge. Mental health is just as important as physical health. If your emotions aren’t in sync, it can be detrimental to physical veracity as well. Food plays a role in this, too. The workplace can be stressful, so supplying foods with vitamin C, B-12, and folic acid can be a great way to improve mood. Countering stress with foods that calm rather than aggravate can be a real help for many. Food fuels performance. The fuel that food provides is in the form of glucose, which allows brains to stay alert. But not all foods are processed at the same rate. Food like pasta and other carbs release glucose quickly giving the body a boost then tapering to a slump. High fat foods offer more energy but the digestive system must work harder to process it, which in turn decrease oxygen levels in the brain, leading to grogginess. These foods described are not necessarily in the healthy realm. Research also supports the connection between unhealthy eating and lost productivity. A study by Brigham Young University found that employees with unhealthy eating habits were 66 per cent more likely to report productivity losses. Foggy minds can’t perform at their best. Healthy snack delivery services replace the fog with engagement. A great trail mix, which includes healthy fats and antioxidants, is just what your workers need to keep up their pace. When your employees are engaged and feeling clear-headed because they’ve eaten a healthy snack, they may be able to do more work than what they or you imagined. When workers get in the zone and feel centred, their efficiency skyrockets. One better choice could lead to many more. In addition to healthy snack delivery, you can also offer education about meal planning and how to incorporate more fruit and vegetables into your staff's diets. You may find that your employees have never been taught how to eat well, or they may have lots of misinformation or misconceptions clouding their judgement. Assist your staff in forging a path for themselves to commit to a healthier lifestyle. Once they see that they feel better at work, this could extend to their food choices outside of work. And, yes they will feel better. A study published by the British Journal of Health Psychology looked at participants' diet, mood, and behaviour over a 13-day period. They found that healthy eating, fruits and vegetables, resulted in happier, more creative and engaged moods. If your employees see that choosing healthy snacks improves how they feel, physically and emotionally, this could be a catalyst for weight loss and more physical activity. While employees certainly deserve breaks and time for lunch, if there are no readily available snacks, they will need to go off-site. That's less time at their desks, which can impact productivity. As there may not be a place nearby, they may have to drive, taking more time away from their duties. If this goes on for several days a week, that can add up to hours a month and days a year. With a healthy snack delivery service, your employees will have a variety of items to choose from, so when hunger strikes, they need only take a walk down the hall. Employees like to be appreciated. The feeling of being valued can be a bigger motivator than even money. One of the most popular perks in the workplace is free food. But free food doesn’t have to just be on special occasions. With snack food delivery, your employees will always have snacks available. Offering monthly snack boxes is a perk that employees will enjoy, and it will be seen as a token of gratitude and respect. This improves the entire workplace and can be one more thing that helps retain top talent. Along with retention comes recruitment. When listing out the benefits of working at your company, don’t forget to add healthy, delicious snacks that are always available. Food allergies and dietary restrictions, in addition to other health issues, can greatly restrict what people eat. Typical workplace snacking doesn’t take any of these things into consideration, leaving many to feel left out. Even if you have a vending machine, it’s unlikely it can offer the types of snacks that those with constraints must have. Some may feel unimportant, because you haven’t considered their dietry needs. With a snack box subscription, you can choose from a huge variety of options that can work for those that need special foods. From vegan to gluten-free to no-sugar, your entire workforce will find something they can eat. This lets everyone know that they matter and that they are part of the team. Eating is a social event. Sharing food has long been way to connect and communicate, going back to the beginning of time. Connections in the workplace can mean a team that works better together because they have mutual trust and genuinely like one another. A sense of camaraderie can often begin over a meal. Co-workers may even find they have similar palettes and start conversations. Even for those that do not necessarily work together, snack time allows them to spend time together, creating an even greater sense of unity. With snacks in your break room, it sets up a great opportunity for bonding. As mentioned above, offering staff healthy, tasty snacks can help retain employees, as it’s a valued perk. Turnover costs money. It takes considerable time and money to hire and replace employees. There are the direct costs like advertising, training, and on-boarding. But there are often indirect ones as well, like lost productivity and loss of key knowledge. Healthier employees also have less absenteeism. Nutrient dense foods keep sickness away. If your employees feed their bodies foods with vitamins and antioxidants, when the seasonal flu bug makes its way through the community, those with a stronger immune system will more than likely be able to stay uninfected. This means there is also less of a chance that it will passed around the office. As opposed to the inconvenience of vending machines, a healthy snack food delivery program from a reliable service offers on-time arrival. You’ll never be wondering when your snacks will arrive. You can also customise orders to ensure you account for special diets or office favourites. You can create a plan that meets your budget and is sufficient to cover your workforce. Engaging a healthy snack delivery service is a great decision for everyone. Employees can improve their health as well as learn about healthy eating - they may even change their lives for the better. Productivity can increase because of engaged minds. Although not a huge perk, free food is a valuable one, so it pays to invest in your staff. Snacking can create connections, which in turn develops stronger teams. Snack delivery could also save you money with less sick, longer tenured employees. And with a snack subscription, you can customise orders and always know they will arrive on time, delivering convenience to you. If you still have questions about how amazing healthy snack delivery can be, why don’t you give it a try for free? 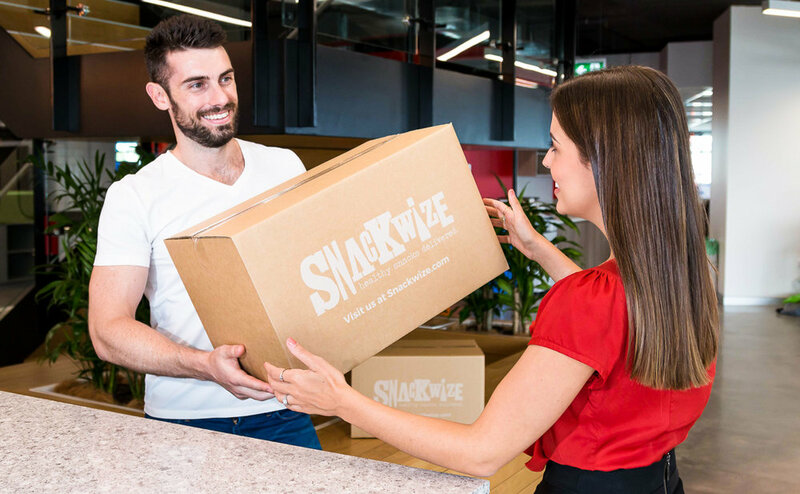 SnackWize offers new customers a free box. Simply pay the shipping, and we’ll send it on its way. Start here.